Mohamed Behi, Somaliland’s Minister of Foreign Affairs, informs on internationally monitored negotiations with Somalia to take place in Ankara. Internationally sanctioned talks between the two neighboring countries of Somaliland and Somalia are to resume under the stewardship of the Turkish government in Ankara. This was informed by the Somaliland minister of foreign affairs Mohamed Behi Yonis during a press briefing in Hargeisa where he also revealed that negotiators from Hargeisa shall depart on Sunday 5th January for the Turkish city of Ankara. This fifth phase of the talks that were originally slated for November 2013 will if actually materialize come after several requests for postponement from the Somalia Federal Government-SFG due to political upheavals in the country which is under 75% control of Al-Shabaab an Al-Qaeda affiliated group battling the SFG and AMISOM troops for control. Foreign minister who refuted circulating claims that the talks have collapsed said, "The talks shall be held in Turkey next week thence the issue of collapse is unfounded" as he made revelations of his recent trip to the UK in company of the Somaliland minister of commerce and investment Dr Mohamed Abdilahi Omar. Said "During our ministerial visit to Britain we held negotiations with DITOL Corp Ltd an international conglomerate with worldwide business portfolios that is interested in investing in various local Somaliland sectors"
This remark by the Foreign minister was in apparent refutation of some media allegations that the duo of Somaliland ministers were in the UK to hold secret meetings with SFG counterparts in view of the fact that Behi was accompanied on a foreign trip abroad for the first time by his predecessor Dr Omar who is currently the Commerce and investment Minister and officially the Somaliland chief negotiator with Somalia. "It is my mandate as the minister of foreign affairs and international cooperation to promote foreign investment in my country as well as link the various interested companies with relevant ministries and ministers" said Behi. On the resuming talks in Turkey anticipation is high as pertains the final agenda for discussions since the stand-off between the two formerly united countries still stands in relation to demands by Mogadishu that the talks are about reunification thence resuscitation of the defunct Republic of Somalia while Hargeisa maintains that the sovereign of Somaliland is not only non-negotiable but irrevocable as well. On the other hand the anticipation of somalilanders is related to the perceived partiality of the Turkish government which has covertly and overtly portrayed its support of the stand by the Mogadishu SFG while dilly-dallying with Somaliland. Suspicion is also rife that the talks are never to accomplish anything apart from being a forum for Tete 'a' Tete between officials from the two neighboring and formerly united countries whose voluntary union of the 1960 later turned fateful was dissolved in 1991 after a brutal civil that was occasioned by the massacre of over 50,000 somalilanders by forces loyal to then Somalia strongman General Mohamed Siad Barre. Though the international community recognizes the Somalia Federal government which incidentally is propped by it, IC, while ignoring the now 22 years quest of Somaliland facts and realities on the ground that clearly distinguish are function state from a failed one are the best judge on which of the two is worthy of recognition. In the 22 years in question Somaliland has managed to secure its borders, establish a government, reconcile formerly warring clans into one cohesive citizenry, mint its own currency and embark on a successful democratization process that has seen 2 presidential, 1 parliamentarian and 2 local council elections conducted to international acclaim. In this same period the international recognized Somalia has failed to organize a centralized government thence the ensuing regional administrations, failed to provide basic [public services anywhere in the country for the long suffering citizens who are incidentally a majority in IDP, refugee and captured illegal migrant camps in numerous countries worldwide due to continuous warfare among the political elites most of them covert supporters and donors of Al-Shabaab militants who control 75% of the country despite thousands of AU troops under the AMISOM banner. After all is said and done the forthcoming talks in Ankara are the 'Gordian Knot' for Turkey due to its government's partiality towards Somalia and the 'Trojan Horse' for Somaliland and its demand for nothing less than dialogue on honorable separation while they, Ankara Talks, are the 'Catch-22' of the SFG and its president of Hassan Sheikh who since taking office has trumpeted his mission and chief mandate as being the reunification with Somaliland. 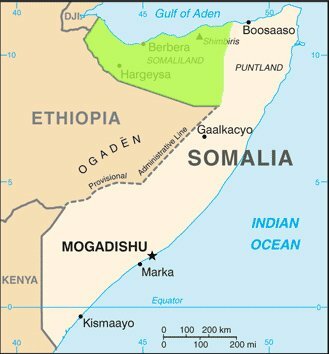 The Hasan and SFG Catch-22 is also closely related by recent machinations within the Somalia parliament in Mogadishu where some of the selected MPs are intended on filling a motion opposing continued talks with Somaliland because the separation of any region, read Somaliland, as enshrined by the cobbled constitution must be debated thence approved or rejected by it, the Mogadishu parliament.